Google hurried to release first Android tablets so they came up with Android 3.x which was designed for devices with high resolution screens. Before that Android tablets had to do with the smartphone version never meant to be used on tablets. Amazingly, Android 2.x was still used in tablets even after the 3.x release because some manufacturers did not receive the specs on time and some just preferred the old one. From this point there was two Android families Google wanted to unify. 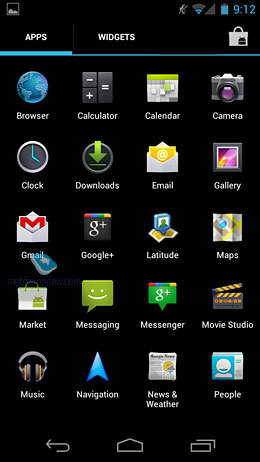 Android 4.0 will be the common platform for smartphones and tablets with the same interface (except for some extra features on tablets). For some time there will be a number of Android versions on the market (2.x, 3.x, 4.x) for in a while tablets will migrate to 4.x completely. Old and budget smartphones will still come with the 2.x version while the new 2012 smartphones will have 4.x on board. 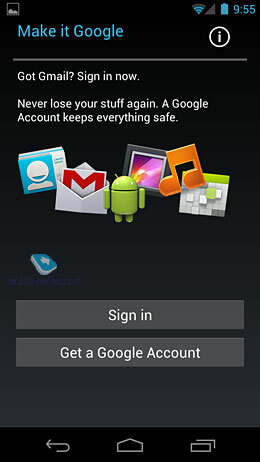 The main objective of Android 4.0 was to unify the UI, separate interface elements and provide similar user experience on different devices. Before i got really familiar with this system I had a feeling this would mean a basic comb over to make stuff look identical. But having tried out many apps on Android 4.0 and previous Androids I can say that the new OS provides a much richer and easier user experience and it really does well in different usage scenarios for smartphones and tablets. 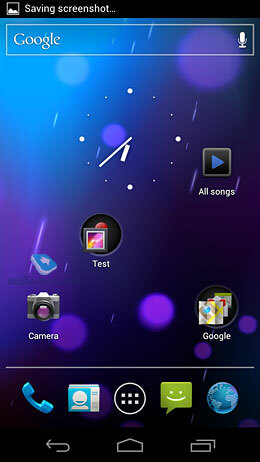 Now I want to review the new UI features of Android 4.0 that was announced on October 17 2011 in Hong Kong on a Samsung event. 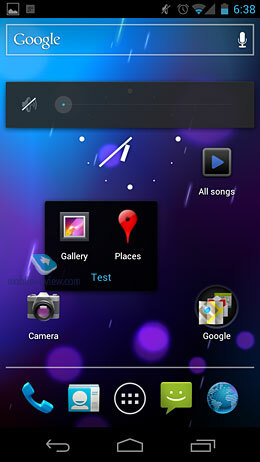 Also the first smartphone running on this OS was presented – Galaxy Nexus (we used one for this review). When working on Android 4.0 Google wanted to get rid of all hard buttons but HTC and Samsung insisted on support for hard buttons as great many phones have already been released with a number of hard buttons that would not be able to upgrade to Ice Cream Sandwich which would be a blow to Android’s reputation so Google yielded and 4.x supports both soft and hard buttons (buttons are not doubled on the screen in case the particular device has hard equivalents except for some context buttons in a number of menus). 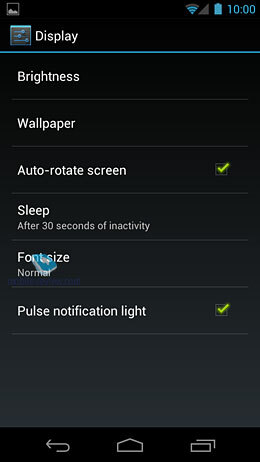 There are three compulsory buttons: Back, Home and Active Applications. The Back button cancels an action or returns you one directory up. The Home button gets you back on the Home screen. 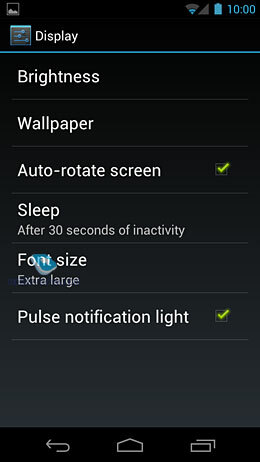 In some apps active buttons can be dimmed out to give more work space. By default there are five desktops each fully customizable. On the top of any desktop there is the Google search bar (it cannot be removed as it is an integral part of the UI). Other manufacturers (other than Samsung) may install a different number of default desktops. 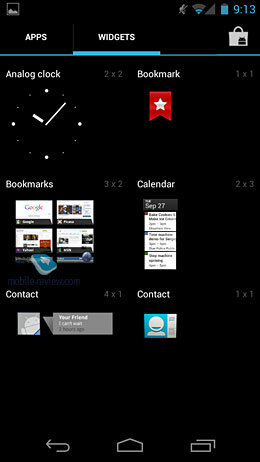 Unlike older Android versions widgets are now resizable – when you select a widget you see a resize frame. 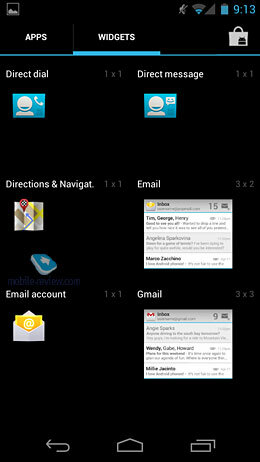 This is a very cool feature – you can make mail and social networking widgets suit your needs. Desktops now support app icon folders. You just need to drag and drop on icon onto another and a folder is created automatically and you can then name it. Google is still sticking to the idea that desktops should be the main working space while the app menu is just storage of all icons. The central button takes you to the app menu and the first thing you notice is the tabs Apps and Widgets at the top and the Android Market icon on the right. Google has ditched endless lists of apps in favor of separate screens you swipe through. Icons are organized alphabetically and you cannot change it. Once again it is a reference to desktops having the priority as the working space where you can organize apps anyway you want. You cannot create folders or create pages in the app menu. This is a downside as compared to some proprietary versions like Samsung’s TouchWiz UI where you can organize apps in the app menu too. 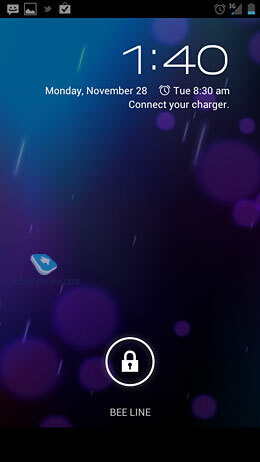 Another novelty concerns the lock screen: by default, you may not only unlock the screen but also launch the camera app. This idea was first realized in the HTC Sense UI but HTC took a few steps further and Sense allows you to add quick access icons on the lock screen, for example, you can quickly access new SMS. Google went another way and gave the status bar a completely new look. Even when the phone is locked the status bar is active and you can pull it down to access the latest events. 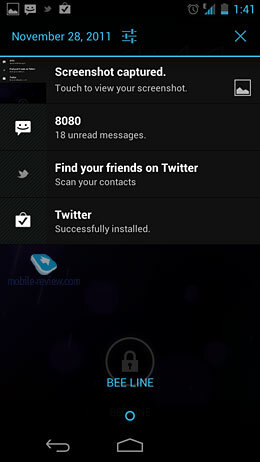 You can also remove unwanted notifications from the status tab simply swipe it aside and it will be gone. This is another new feature of the new UI – similarly you can close any app by swiping it aside in the active apps menu. 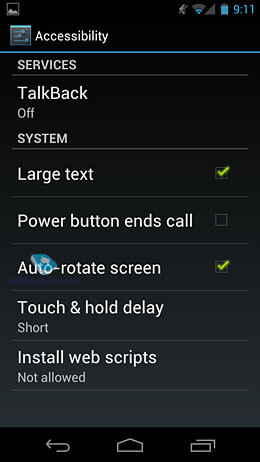 Gestures are now a lot more common in Android 4.0 like e.g. side swiping. Unlike MeeGo which is completely based on gestures (the Swipe UI) they don’t seem to be redundant in Android 4.0, quite contrary, in 4.x they are intuitive and simply complement basic UI features. Google simply added gestures to the OS instead of changing basic UI interaction and it is really great. 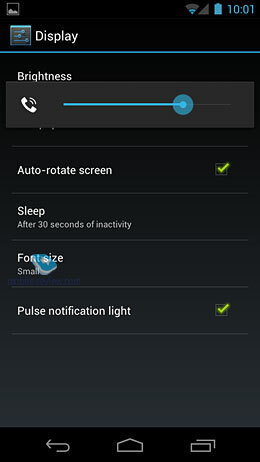 The standard status tab no longer has quick access to turning on and off Wi-Fi, Bluetooth etc. instead there is a dedicated power widget. I loved that you can add not only icons but also icon folders to the bottom icon bar. 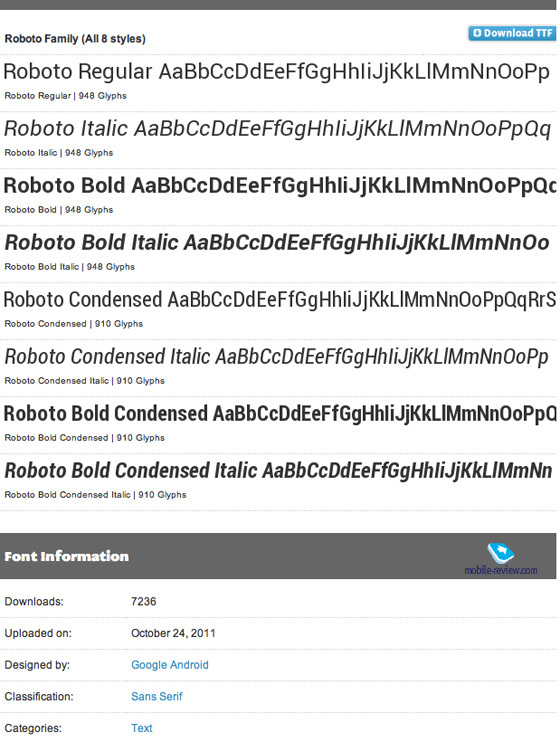 Android 4.0 uses a new font called Roboto. 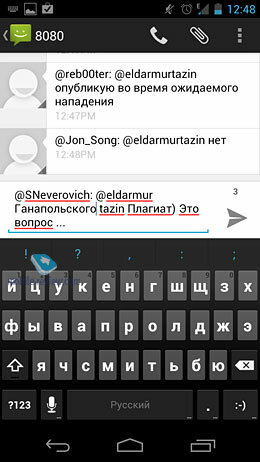 It is a very plain font that you can resize at will – you had to install third party apps to do that in older Androids. The font is very legible and pleasant to read. You can use it on old Android versions by downloading it from here or here. Text editing has the old features like selecting a word, a part of text, copying, cutting and pasting and the new one – you can now move a part of a text by dragging and dropping the selection – a very useful feature. 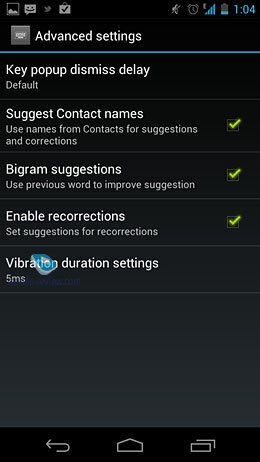 Android 4.0 features a new system of spell check – the system suggests up to three variants for words it thinks were misspelled. 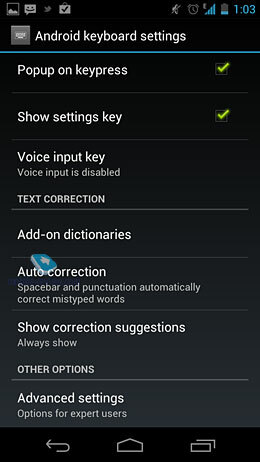 You can add words to the dictionary and add whole dictionaries for the spell check feature. The key pad is very convenient and features a number of new features. 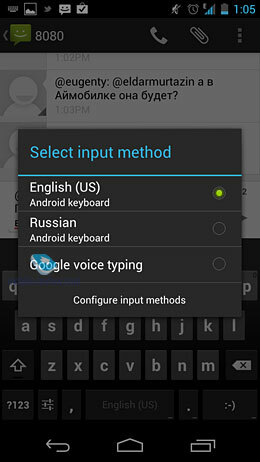 One of them, unfortunately, is the absence of the language switch button. To switch between languages you need to press and hold the space button which is really inconvenient. 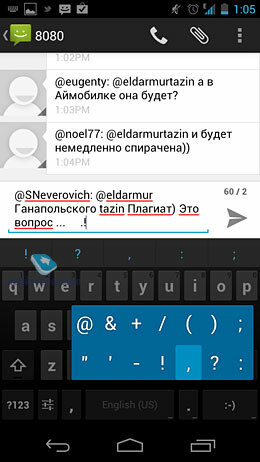 The dev team promised to fix it and add the switcher button (alternatively you can install a third party key pad). 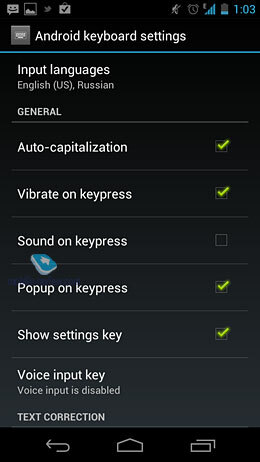 There is a great variety of additional key pad settings to suit any taste. Multitasking works magic and like in HoneyComb active apps are displayed as icons (their number is only limited to the system memory). You can swipe an icon aside to close an app. On the first start-up you cans select the maximum available font size for visually impaired users. 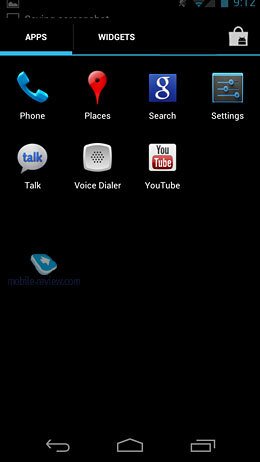 The OS also has the Talkback feature that can voice all events, read messages and tell you where you are. It is a really great feature and a big advantage as compared to other platforms. 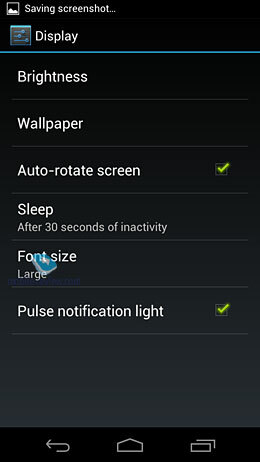 The release of Android 4.0 has surely given headaches to its competitors. Microsoft’s WP7 is now falling tremendously far behind it – it does not have desktops, or widgets, or folders, or a proper notification system. And this is only a short list of what Windows Phone 7 does not have. I think iOS5 is playing on the same level as Android 4.0 (there strong sides in both platforms). I also think that these two are the only modern mobile platforms as of today and they compete only against each other. Only they have modern, fully customizable UIs. In my opinion, Google has succeeded with their main objective i.e. 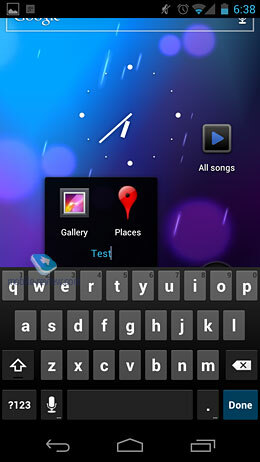 to create a unified Android with a modern, sleek and user friendly interface. The animation is very nice and really improves everyday user experience (it is not superfluous or irritating). The new Android is also pretty fast as you can see on the video (it is faster than Android 2.x on Galaxy S2 which has more powerful hardware). In the next part we will talk about the bundled apps and their features, also Google’s cloud services and other features of the new OS. Do you want to talk about this? Please, go to our Forum and let your opinion be known to the author and everybody else.